Browse: Home / 2016 / November / 27 / Climate Professor Says German Climate Science Hyped By Sloppy, Politically Corrupted Media! German Klagermauer TV here shows a recent presentation made by veteran climatologist Prof. Dr. Werner Kirstein, in the lead up to the Marrakesh climate conference. Prof. Dr. Werner Kirstein calls climate protection a form of populism where governments hope to garner praise for their climate protection efforts. Image cropped from Klagemauer TV. Kirstein has become an outspoken critic of the manmade global warming science. In his presentation, he explains in layman terms how the climate system works and why the often ballyhooed climate catastrophe is mostly “media propaganda”. At the start, the 40-year climate science veteran explains how today’s climate is nothing unusual when taken in a historical context, and shows that previous interglacials were even warmer than the current one. Climate is a highly variable system and changes, even sudden ones, are nothing unusual. Another point he makes while explaining climate history is that CO2 rises always followed temperature rises, and not vice versa. Over history there has been very little correlation between CO2 concentration and global temperature. Kirstein maintains that the warming over the past decades has been mostly due to natural causes associated with the climb out of the Little Ice Age, and therefore is not surprising. At the 17-minute mark he slams the greenhouse heat trapping theory, as it is taught today. Kirstein says the CO2 acts to diffuse long wave radiation from the earth and that the heat should appear at the mid to the upper troposphere, and not the earth’s surface. He says that the greenhouse effect as presented to the public has already been theoretically refuted and “falsified” by Tscheuchner and Gerlich. At the 19-minute mark he says that there is indeed a greenhouse effect, but not the sort that heats the climate. Rather CO2 has a greening effect, as it serves as food for plants and in this aspect is positive for the planet. Plants grow optimally when concentrations are quadrupled (for C3 plants). At the 25;20 mark Kirstein looks at the global warming temperature projections for the future, and says global temperatures have fallen way short of these projections. In the presentation he slams Al Gore for cherry-picking and inappropriately and unrealistically extrapolating trends out into the future when knowing full well that the chaotic climate system in fact doesn’t behave that way. Professor Kirstein also criticizes the media for hyping the natural climate changes, reminding viewers that earlier they had warned in the 1970s of a coming ice age, before turning on a dime a decade later and predicting a sea level rise that would soon submerge half of the Cologne Cathedral. “They were making people crazy with it.” He adds at the 34:30 mark that the German media has lost credibility on the subject. At the 32:30 mark he calls the 2°C target set by policymakers “nonsense”. Also the claims made by the German media that the Sahara Desert is expanding get refuted by Kirstein when he shows at the 35:50 mark how the Sahara is in fact shrinking. Kirstein slams a variety of tricks that the media use to mislead viewers. At the 40:00 mark Kirstein presents a chart of Germany’s mean temperature over the past 28 years and asks where the warming is. The trend is behaving opposite to what was projected to happen! Germany has not seen any warming in 3 decades! Chart: Josef Kowatsch, image from Klagemauer TV. At 44:00 Kirstein explains that climate has to be observed for minimum 30 years, better 50, or even 100, before one can draw conclusions. Making claims on events that occur over a period of only a few years “is a joke”, he says. He slams German ZDF television at 50:00 for sloppy reporting in their failure to properly research sea level rise as related to tectonic plate movement in a show on sea level rise for Micronesia broadcast in 2009. Throughout the presentation Kirstein dispels of one media climate panic scenario after another — everything from polar bears in the Arctic to sea ice at the South Pole. The media often present future scenarios as fact and so misinform their audiences. At the end Kirstein blasts how the state controlled media has in effect politicized the science. He says climate protection is now a form of populism where governments hope to garner praise for their climate protection efforts. At the end he quotes Danish astrophysicist Henrik Svensmark: “It has nothing to do with science”. You site has started popping up a box saying Authentication required. Says you have to login and asks for password, which it warns will be sent unencrypted. I click Cancel and it disappears. Oh, so I’m not the only one getting that, although only on an older iPad. Not seen it on my laptop. He says that the greenhouse effect as presented to the public has already been theoretically refuted and “falsified” by Tscheuchner and Gerlich. The reference to Gerlich & Tscheuschner I assume means this paper that is freely available for download. On Falsification Of The Atmospheric CO2 Greenhouse Effects. Here’s a paper replying to one of their critics. OK, here’s the link to the whole article on his blog. I often have a comment delayed, saying it is a duplicate, but then it appears later. Not a big deal. “Authentication required” — I’ve never seen this. Agree Great post. it would be good to watch a translated version of the video. In general, Dr Kirstein made a good presentation. One problem is the statement that climate sensitve gasses do radiate in all directions but do not radiate down to the surface. He refers to Tscheusschner and Gerlich, but their paper has been debunked by many sceptic Scientists as well. CO2 an comrades radiste in all directions, so a certain amount of the heat comes back to eaarth, some radiates into space and some heat is trandferred by contact withoter gasses, which have later again contact with climate sensive Gasse and then are radiated into space as well. Downwelling radiation can be measured even by laymen. The background radiation of the space is -270°C, which is 3°C above 0 Kelvin. With my IR-Thermometer directed to the sky in measure here in Germany between -70 to 10°C, which is 200 – 280 °C above the space backround radiation measured by satellites. When I measure with a tilt angle near the orizon, the temperature goes up, because there I get more radiation from the lower layers of the air. Yes even if there is a so-called greenhouse effect, there are so many other factore which affect climate sensitivty, which is estimated by 0.25-1.5°C per doubling. Aiming your IR-Thermometer at the sky and horizon is utterly useless in showing atmospheric warming. It is neither accurate for that kind of measurement nor without considerable mathematical adjustments to the reading will it be close to the true temperature. IR-Thermometer are made for close (most are calibrated to be used withing 4 meter range) temperature measurement and then ONLY from non shiny surfaces. The instructions that came with the IR-Thermometer should tell you the limits of the instrument’s calibration and how to use it for accurate measurements. If there are no instruction showing these requirements throw the IR-Thermometer in the trash as it is worthless regardless of cost! Pointing it at the sky gives a reading — yes, but it is meaningless as there is NO CALIBRATION for this function. What is the IR emissivity of the sky? (see here http://www.scigiene.com/pdfs/428_InfraredThermometerEmissivitytablesrev.pdf for examples) What is the size of the zone (spot size) being measured? Without these parameters your reading is bogus. I’d like to see a link (or three) to that. I’m skeptical of the validity of their criticism. DrRoySpencer.com from UAH (one of the the 2 satellite curves) wrote al lot of stuff about the CO2-not-warming-issue on his site. He also used the IR-thermometer and other experiments to show that there is downwelling radiation. 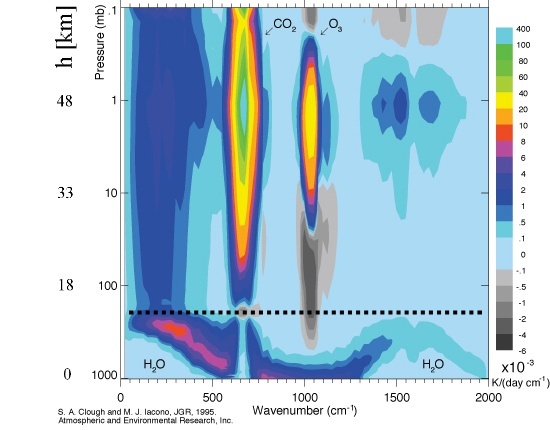 IR thermometers are not measuring radiation from CO2, but IR-radiation in general. For IR it doesn’t matter if comes from some centimetres or kilometers. And they are showing us that there is something coming down, even if the measurement is not really exact. IR thermometers are using a thermopile, just as the Pyrgeometers for professionally measuring downwelling radiation.